JW: Many people have written about the Tsugaru shamisen in all sorts of different ways. OSABE Hideo 長部日出雄 (b. 1934) has even won the Akutagawa Prize for the stories he wrote about it. What troubles scholars the most is that there are all sorts of theories, some of which are now accepted as fact. 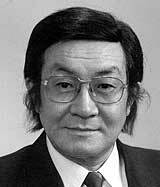 DAIJÔ Kazuo 大條和雄 (b. 1928) for instance claims that the Tsugaru shamisen was by and large the work of one man, the legendary Nitabô 仁太坊, and now if you go to Nitabô's hometown of Kanagi 金木 (now part of Goshogawara City 五所川原市), you can see a big stone monument proclaiming that this is the birthplace of the Tsugaru shamisen. But is it really? We no longer know what is fiction and what fact. That is our biggest problem. We would be very happy if you could tell us a little bit about what you know about the origins and development of the Tsugaru shamisen up to the present day, about your own role in that development, and about your experiences during all those years. Yamada: Let me start with what I can remember personally. It all began with me falling in love with the sound of the shamisen. We had a phonograph at home, and I remember thinking, "That is just great! The songs are great, but the shamisen even more." In those days about the only shamisen players you'd hear were what I always call the Big Three - Kida Rinshôei 木田林松栄 and Shirakawa Gunpachirô 白川軍八郎. The last one, Fukushi Masakatsu 福士政勝, my own teacher, hardly left any recordings - one out of ten maybe, if that many. Almost all records are by Kida and Shirakawa, and it was listening to them that gave me the itch to learn the shamisen. Oh, I loved the songs too, but the shamisen was just so special that I thought, "I've got to do that too." And because we had a shamisen lying around the house, I picked it up and taught myself to play, listening to the records. ST: You had a phonograph at home? Yamada: Yes, we did. It belonged to my father. You know, one of those box-type things with this enormous trumpet sticking out. ST: And you were born in 1931, so this must have been in the 1930s, right? Yamada: Right. I was born in 1931, and we didn't get the phonograph until after I entered elementary school, so that must have been some seven, eight years later. I guess it was 1940 or 1941 when I fell in love with those records. And that's how I got started. That was when I first heard the Tsugaru shamisen. JW: And when did you first consider the idea of doing this professionally? Yamada: About the same time as when I first listened to those records, I guess. Yes, for I remember thinking, "I wish I could do that for the rest of my life." ST: And you happened to have a shamisen lying around the house. Yamada: Yes, we did. I don't think I've ever heard my father play it - we just had the thing. He'd got it in exchange for a bale of rice. Someone came to the door and asked if he could get some rice if he gave my father a shamisen, and that's how it ended up at our place - in payment for a bale of rice. ST: Nowadays one bale of rice wouldn't even begin to pay for a shamisen. JW: There used to be this idea that all shamisen players were either blind or born in very poor families. Did that image still exist when you were younger? Yamada: It sure did. Why everyone hated shamisen players so much I didn't understand at the time. I was still a kid, you see. Later I found out why. My father couldn't stand the sight of them. Oh, he let me have it when I first told him I wanted to play professionally. "If you want to do it for a hobby, go ahead," he said, "but don't expect you'll ever make a living out of it. You turn pro, and you'll never darken my door again!" My mother kept nagging me too: "Play if you want to play, just don't do it for a living! You can't earn your keep with a shamisen. Whatever you do, don't you ever, ever turn pro!" ST: But why was that? Yamada: Because all professional players were so poor they could hardly eat, and when they ran out of food completely they'd go to their brothers or sisters for things to eat. They'd stay with relatives and sponge on them for a week or ten days or so. I mean, where else could they go? To a flophouse? You need money, even for a flophouse. That's why they were always bothering their kin. Yamada: No, you're right. There was nothing wrong with Kida's eyes, and Fukushi also could see fine. But Shirakawa was blind. That's why he started playing when he was still a child. He had no other way to earn a living. JW: Chikuzan was the same way. ST: I believe this is a very important point in the history of the Tsugaru shamisen. Historically, shamisen players have the image of tramps, blind minstrels strolling the towns, but I don't know if that is entirely justified. There were lots of players with perfectly normal eyesight who led perfectly normal lives and even crossed to Hokkaido. JW: I wonder if that was not because around the beginning of the 1930s it had become possible for professional players to make some kind of living with their shamisen. There used to be a custom called kadotsuke 門付け, stopping at the gate of a house and play until you received some money or food. Until about when did that custom survive here in Tsugaru? Yamada: Kadotsuke? Until Kida became popular. Kida, Shirakawa, Fukushi - once the Big Three arrived, the days of the kadotsuke were over. After that, the shamisen was only played on stage. JW: Even at shrine festivals and other festive occasions? Yamada: The same. You'd go to a shrine or a biggish hamlet and rent a house. That's where you'd make your stage - just two tatami mats or so, raised a little. That's how I got my start. I never did any kadotsuke. Yamada: Chikuzan? Right, he did, the way I just said - walking. He'd go to Hokkaido and walk from house to house saying, "Begging your pardon." That was Chikuzan. The way they'd do kadotsuke before, the player would stay in the road, outside the gate. He'd go to a big-size hamlet, festival or no, and start playing his shamisen in the street with a little box at his feet for the money. You were supposed to put money into that box, but kids, they like to play jokes (I was one of them), so we'd drop pebbles into the box, and then the player would think it was coins - I mean, the man was blind - and play some more. Yes, I've done my share of mischief. But that's the way they used to do it, in the street, with a box at their feet. JW: When you read the literature, you realize that strolling Tsugaru shamisen players were called a lot of ugly names like bosama 坊さま or hoido ホイド [both terms denoting various shades of the word "beggar, vagabond"]. Some scholars I know were wondering if one reason why strolling players were so despised was perhaps that they were burakumin 部落民, or had some sort of connection with burakumin. Was there a connection like that? Yamada: Well, yes. In those days, people in the towns wouldn't be caught dead playing the shamisen. They wouldn't play it, and they wouldn't listen to it. But in the villages in the countryside, villages with 20 or 30 or 50 houses they would. And that's where the shamisen came from. ST: What Westerhoven is trying to say is this: In Hirosaki 弘前 for instance there were neighborhoods called "bosama towns," and the people living there were called, in a word we really shouldn't use any more, eta えた. So the question really is, "Were strolling players so looked down upon because their art originated with people belonging to that class?" Yamada: Well, what I can say about that is that the music we call Tsugaru shamisen was not born there. Oh, those people also played, that's a fact, but the Tsugaru shamisen as music was born in the farms of the countryside. What happened was that people like those you just mentioned, who lived in towns, were unable to feed themselves and got out their shamisen and did the rounds of the villages - for food. JW: If you can state that so unequivocally, then at least this one question is solved. In other words, Tsugaru shamisen players were looked down upon not because they were outcastes, but because they were poor. ST: And because it was countryside music and because in cities like Hirosaki tramps would also play the shamisen, it finally developed that image. Yamada: It's as I said: ordinary folks could play the shamisen at home, as a hobby, and didn't have to go on the road with it. The ones playing the shamisen for a living were almost all beggars. That's why my father told me so many times, "Don't turn into a beggar, shamisen players are all bums. You can play for fun, as long as you don't go from house to house with it." He'd never stop nagging. ST: But that was not only the Tsugaru shamisen. I have a feeling that there was a prejudice against any kind of music. For instance, when I was small I loved the piano, but whenever I practiced my father would complain, "That sort of thing is only good for tramps and vagabonds." Yamada: The piano too, eh? Well, I don't know about pianos, but I do know I've had an earful about the shamisen. My mother would never let up: "As long as it's a hobby, fine, but once you try to earn your bread with it I won't ever let you into the house again." ST: Just like my father. "Don't you turn into a tramp," he'd say. Yamada: With the Tsugaru shamisen, charging admission at the door came much later. The best a pro could do was stand at the gate, beg everyone's pardon, and earn five or ten yen for his performance. That's how he made a living. That's why my parents never stopped drilling it into me: "Never let us see you turn into the sort of bum who cadges money from folks and then goes on his way again. And if you won't listen and go on playing the shamisen, you'll never enter this house again." Yamada: Oh, I agree completely. Nitabô never did this all by himself. There were dozens of good players, all over the place. It's just that at the time Nitabô was better than all of them. But that's all: he was just better than the rest. 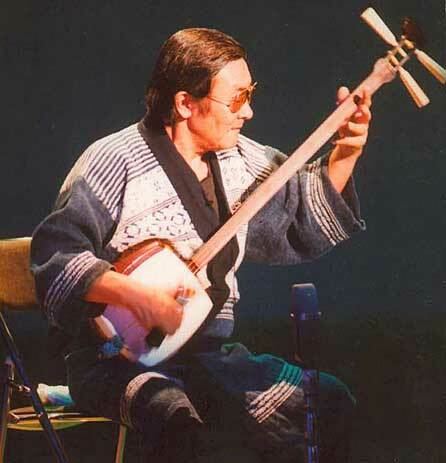 But even Nitabô was not good enough to have created the Tsugaru shamisen all alone. ST: I must confess that at this point I don't really see him as the Father of the Tsugaru shamisen. How about you? ST: Were blind people the only ones who played the Tsugaru shamisen? Yamada: Most of them were blind. The time that anyone could play the shamisen, good eyesight or bad, did not come until Kida became popular. JW: OSABE Hideo wrote a short story, "Tsugaru Yosarebushi 津軽世去れ節" about an extraordinary player called Momo from Kase 嘉瀬の桃, 9 and this Momo from Kase had ordinary eyesight. But he died in 1932 and never made a single record. Yamada: There you are: no records, no tapes. His music's gone. ST: It all goes to show that the history of the Tsugaru shamisen is very vague until you get to the Big Three. Yamada: We know the names of people, but we don't know how they played. Their sound has not survived. But there were a lot of players who were not a whit worse than the Big Three, that's a thing that's certain. I've heard a lot of shamisen music from the age before that of the Big Three, and I remember it in my guts. "Ah, that's the way they used to play then," I'd say to myself. Not that I heard the music played at the time, but I've listened to lots of old folks trying to imitate the style of those days, the style that was popular then. JW: But I suppose the Big Three had teachers of their own. If you could establish a genealogy of players active before the advent of the phonograph, maybe you'd learn a little bit more. ST: My home was in downtown Hirosaki, close to the castle, and we used to have beggars visiting us. They never came in at the front door, but at the back, through the kitchen. But I can't remember one ever bringing a shamisen and playing something on it. The maid usually gave them some small change or some rice or so. Yamada: There weren't really all that many blind people around, and not every blind person played the shamisen. Still, I'd say that there used to be more blind people in the past than nowadays. Yamada: There were. So blind people played the shamisen, they became itako, they did all sorts of things, really. JW: TAKAHASHI Chikuzan died about five years ago. Could it be that of all the strolling minstrels who did kadotsuke, Chikuzanwas the last one? Yamada: All Chikuzan really did in those days was play accompaniment. But then there was a rapid change in the nature of Tsugaru folk songs. Younger people composed new melodies, and the songs themselves changed very fast. Now Chikuzan simply couldn't keep up with those changes, he was just unable to accompany the new songs of the younger generation. But Kida, Shirakawa - the Big Three, in short - they could. They hit the strings so hard you wouldn't believe it. Chikuzan continued to play the old songs the old way, and he did it superbly, but in fact he couldn't keep up with the music of the younger generation. JW: If you're right, it would mean that there are at least two different schools in Tsugaru shamisen music: the traditional style of playing - the school of Chikuzan, so to say - and then the Big Three and later yourself, a more contemporary style, if that's an appropriate term. Yamada: Two schools, that's right. As I said, Chikuzan couldn't adapt to the changes the younger generation made. He couldn't keep up. The ones that could and did were Kida, Shirakawa, and Fukushi - the Big Three. And because they were so damned good, everyone who liked the Tsugaru shamisen took to their music. Chikuzan was too predictable. He always played the same old songs the same old way, but the Big Three, they tried all sorts of new things, and that's the way the music changed. JW: But when I first came to Japan, in 1975, all you heard was Chikuzan. I'd hardly ever heard of the Big Three until fairly recently, when I started to research this topic. People had told me all those years that Chikuzan was the God of the Shamisen. ST: Maybe that's because he went to Tokyo and hit the music scene there. And don't forget, he was a marvelous storyteller. Yamada: Chikuzan didn't really become famous until the mass media discovered him and introduced him nationwide. Before that, no one had ever heard of Chikuzan. Here in Tsugaru it was the Big Three who were famous. People said that if it wasn't by the Big Three, it wasn't Tsugaru shamisen. But after Chikuzan became famous - and he still is - his style of playing became what people prefer, and now the Tsugaru shamisen is that of Chikuzan. JW: Let's go back to your personal history. You were about fifteen, an age when you had to choose a profession. Something tells me your father was against it and you ran away from home. Am I right? Yamada: Absolutely. I'm a runaway. I mean, it's not as if my parents told me to please go and play the shamisen. No, all the time I sat practicing, they kept drilling it into me: "Don't do it! Don't do it! Don't choose this road!" It was all right if I played for a hobby, but under no circumstances did they want me to turn pro. I couldn't very well not run away! So I did, on the sly, so I could be what I wanted to be. JW: And then where did you go? Your parents lived in Ajigasawa 鯵ケ沢. Did you stay there, or did you go straight to Tokyo? Yamada: No, not to Tokyo. I went to Fukushi Masakatsu's place. You see, Fukushi had come to my old school for a concert, and I'd gone to hear him. And man, was he good! It gave me the shivers, hearing Fukushi Masakatsu perform live. It gave me gooseflesh! I went straight home, grabbed my shamisen, and took off. That afternoon he had been playing at Minami Kanazawa Elementary School 南金沢小学校, in the evening he was scheduled to play at a school in Akaishi 赤石, and in the evening at a theater in Akaishi. So I walked straight to Akaishi, where Fukushi was, and from that evening on I stayed with him. And that's how I became a pro. I didn't tell them any stories at home about going off to practice the shamisen, I had to sneak off in secret. I mean, my father had scolded me so many times that I shouldn't turn pro, there was no other way. ST: I'm a little surprised that Fukushi took you in right away. Yamada: Oh well, he didn't have enough young people - to carry his luggage, that is. He carried his shamisen himself, but of course he had lots of other stuff too. Fukushi was happy to see me. "I'm glad you came," he said. So I ended up having to carry his luggage for him. That entire first year I never even had a chance to play. I started wondering what the hell I was doing there. I even thought very hard about running off some place else, but I figured that this was where I'd be getting my start, so I decided to stick it out. If I had to start as a luggage carrier, well, I'd just have to grin and bear it. JW: So when you suddenly showed up, Fukushi didn't ask you to play something for him? Yamada: No. All he told me was, "You learn to play the shamisen by listening." That was it. He didn't teach me anything - not a single lick or trick. "You learn to play the shamisen by listening." Only that. Listening, that was all. So I'd be sitting off stage, quiet as a mouse, and watch him play - one passage, or maybe two. And I'd do my best to remember it. And then the following day I'd practice only that one passage, and once I'd got it, I'd practice another passage the day after that. Oh, there were lots of things I wanted to play, but he never taught me. He really didn't. "Listen, then learn." That was Fukushi for you. JW: I found the same words in OSABE Hideo's stories. Yamada: Well, you really cannot learn the Tsugaru shamisen "from" someone. It's all improvisation. You can listen to something, but that doesn't mean they can teach it to you, that very same thing. They can only teach you something similar. ST: So where did you go after you joined Fukushi in Akaishi? Yamada: After that we went to Kitakanegasawa 北金ヶ沢 and Ôdose 大戸瀬, and from there we took the train to Noshiro 能代, in Akita Prefecture 秋田県. ST: So you went to Akita. Who promoted tours like that? Yamada: Oh, we had promoters wherever we went. ST: Promoters wherever you went? Yamada: We had one in Noshiro, a man called JIN Takeo 神たけお. He was also from Akaishi, originally, and after he left the Army he'd gone to Noshiro to become a show business promoter. Noshiro was his home base. We toured all of Akita Prefecture with Jin, and then he handed us over to a promoter in Hachinohe 八戸, on the Pacific side of Aomori 青森県. So we toured the area around Hachinohe, and then we were handed over again to a promoter in Hokkaido. That's the way we traveled. So we took the railroad into Akita, to Jin's place, then on to the Hachinohe area, and after that we went to Hokkaido. JW: So you went to Hokkaido as well? Yamada: Walking all the way. The whole circuit took one year and two months. But when the war ended, my brothers were demobilized and I went home, to help with the charcoal burning. I stayed with them for about half a year, but it was hopeless. I told my brothers, "I just have to go out and play the shamisen." And they all said, "Do it! Go ahead!" You can't believe how happy I was. I mean, I'd gone home to help, thinking they'd be against the whole idea, and there they were, saying "Go, man! Go!" You bet I was happy. And ever since then I've walked this road. . . .
ST: So where did you go then? Did you start for yourself, or did you go back to Fukushi? Yamada: I started for myself, very small, with about seven, eight people. . . .
ST: Are any of those people left, I mean the people you started your group with? Yamada: Nobody. They all quit. At the time I collected six or seven people - some of whom also used to work with Fukushi. That's how I got started. We couldn't perform anywhere big, like a theater, so we'd go to a big village or hamlet and rent a big house. . . .
ST: Did you have to pay a promoter for that? Yamada: No way. We did everything ourselves. Yamada: Yes, by bicycle. I'd bicycle around for a week, all the way to Ishikawa 石川 or Ôwani 大鰐 or Ikarigaseki 碇ケ関 - everywhere by bicycle, looking for a place we could perform. When I'd picked a place, I'd go back and we'd fix things so we could do a gig that same evening. The next day we'd get up really early, but we wouldn't perform around noon. Around noon you wouldn't get anyone coming in. We only performed nights. Then the next day we'd go to the next place, and the day after that to the next place, by bike of course, and see if we could get an audience together. That's the way we did our rounds. JW: About what year was that? Yamada: I guess it was about 1949. JW: But about your group. . . . Didn't people any longer use the term za 座 (troupe) in those days? Yamada: No. Older performers used to do that, add za to a name - the "YAMADA Chisato Za," or the "SASAMORI Junzô Za" 笹森順造座.11 But nobody had ever heard my name, so it would have been useless to name the group after myself. We started out as the "Tsugaru Min'yôdan" 津軽民謡団 (the "Tsugaru Folk Song Group"). JW: In other words, you didn't only play the samisen, you sang songs. . . .
Yamada: Exactly! We started with folk songs. I mean, in those days nobody would have come in to listen only to a shamisen. The shamisen was only for accompaniment. Yamada: Definitely. Song, shamisen, and te-odori - they were inseparable. You couldn't have one without the other. And together they made what we call an utakai 唄会, a songfest or song competition. That's where I have my roots, in the utakai - not in the solo shamisen. JW: And did you organize those utakai yourself? Yamada: Yes. I'd ask other people to help out, like the singers. But the places, I'd decide those by myself, riding around on my bike. We didn't ask the help of any promoter. JW: I've read that in those already there used to be utakai held in Hirosaki Park, during the Cherry Blossom Festival. Are you saying that it was not the city organizing or sponsoring the utakai, but that you did it yourselves? Yamada: The city never organized a thing at cherry blossom time. They didn't give us any money either. Everything was organized by the people interested in doing the utakai. We'd get together and ask the city for the use of a spot, and the Board of Tourism would say, "Wouldn't that be nice now, cheer the place up a bit," you know. So they'd give us a site we could use, and that's where we did it. JW: Did you charge admission, or did you leave it up to the audience, after the end of the performance? Yamada: We never charged anything. We all performed for free. For love. ST: So what did you do for money at cherry blossom time? Yamada: We didn't play for money. It was zero, the entire Festival. One week, two weeks, ten days - we did it all for free. Everybody. That is, only the groups that could afford to do so. People that couldn't, didn't. So it's not as if everyone did an utakai in the Park. But right away it would be the season of the herring catch. Just when the cherry blossoms bloomed, or when they'd begun to fall, they'd be in the middle of the herring catch in Hokkaido. We'd be waiting for that, let me tell you. First play in Hirosaki Park, and then pack up your things and get to Hokkaido as quickly as you could. ST: I suppose you made lots of money in Hokkaido? Yamada: At the herring catch? You bet we did. And if we could still have gone to Sakhalin, in Sakhalin as well. I never went to Sakhalin, though. But there was no herring in the Pacific, so we'd stay on the Japan Sea side all the time, from south to the very north, all the way to Wakkanai 稚内. And then the islands off Wakkanai - Rebun 礼文島 and Rishiri 利尻島. That's how far we went. ST: You went that far? ST: And then you'd rent a hut. . . .
Yamada: In bigger towns a theater, but where there was no theater, we'd rent a big house. JW: But I suppose you charged admission then? Yamada: Sure we did. On Rebun and Rishiri you couldn't really go about charging 100 yen - or even in Hokkaido or Honshu. But even though they had to pay admission, it was like, "Come in, come in, come in, and no pushing please!" On the other hand, if they were out to sea for very long, you wouldn't get a soul. But when the sea turned rough, then it was "No pushing!" again. We could charge as much as we liked. Yes, we'd earn a lot on the islands, but only when the sea was rough. When there was a calm, nobody'd come in. During a calm we could stay there for a week, and never a soul in sight. It was as if we were on vacation. All that free time was no fun, though. I mean, you could go to the islands, but in calm weather you wouldn't have any audience at all. A bit of a blow, that's what you needed. ST: I once did a folk song survey in Esashi 江差 during which an older lady sang a number of songs for me. She knew all sorts of interesting songs, including some old Tsugaru songs that have disappeared over here. When I asked her how she knew those songs, she explained that when she was younger she had worked in a kind of brothel near the harbor, and that's where she had picked them up. But that is by the way. What I really wanted to know is what sort of songs, what sort of tunes those fishermen liked to hear. How did you choose them? You couldn't very well have played Tsugaru songs alone now, could you? Yamada: Back then? Back then they'd be ballads, of the kind we call rôkyoku 浪曲. While we were on the road, that's all we did - Tsugaru songs and rôkyoku. And then a few skits. Those three things were all we did. But of those three, the Tsugaru songs were the most popular. Spot on, so to say. JW: Nowadays when you think of Tsugaru songs, the three that come to mind immediately are "Jonkarabushi" じょんから節, "Yosarebushi" よされ節, and then "Aiyabushi" アイヤ節, I suppose. What else did you perform, besides those three? Yamada: Anything they requested, but mainly "Jonkara," "Yosare," and then "Oharabushi" 小原節, those three. "Aiya" has become popular only recently. Back then you didn't hear it very much, although it's pretty well known today. ST: And did you already perform solo shamisen in those days, without any vocals? Yamada: You see, Shirakawa played the shamisen so beautifully, the audience would cry out, "Forget about the song, give us some more shamisen!" And even then it was not enough. In fact, he was just playing the introduction that's needed before the singer starts the song. It was just the intro, and yet people kept clapping and going, "No song yet, do that intro again." So then Shirakawa'd do it again and go on a bit longer, and the audience loved it. And that's how the shamisen gradually got to be a solo instrument. It all started because Shirakawa's fans made him play longer, but once Shirakawa was doing it, Kida did it too, and Fukushi too. JW: I see. But for how many years did those Hokkaido tours continue? I'd like to know a bit more between the period after Hokkaido and before "Yama'uta." ST: The herring catch gradually became worse. Did you get less work in Hokkaido as they caught less herring? Yamada: We did. When the herring became scarce, people stopped coming. At first we'd still go, but most of the time we wouldn't earn a thing, so we gradually stopped going. ST: About what year was that? Yamada: I can't put my finger on it. It got worse little by little, year by year, and then, within four or five years, there wasn't a herring left. Once it got worse, it got worse so fast you wouldn't believe it. When we first went to Hokkaido, after the war, on Rebun and Rishiri you couldn't walk down the street without stepping on herring. All those fish were lying there, right in the middle of the street. You couldn't help but step on them! That's how many they used to catch. JW: And after Hokkaido you went straight back to Tsugaru? JW: Was it possible to make a living back then, doing Tsugaru songs and playing the Tsugaru shamisen in Tsugaru itself? Yamada: A living? . . . Well, sort of, I guess. When the bottom fell out of the herring fisheries, it wasn't any use going to Hokkaido any longer, not even to Rebun or Rishiri. If the weather was rough, it was hard to get there; you'd be stuck on the mainland of Hokkaido for a week or so. But even if you were there for a week, if the herring boats couldn't sail, people would be pushing to get inside, even if you charged twice as much admission as usual. Two days like that, and the rest of the week you could take it easy. But if the weather was calm, you might as well give up. We'd have to borrow money, all of us. Just to pay for the inn we'd have to borrow money. JW: Ah, the inn. In Osabe's short stories - and they are set some twenty, thirty years earlier - touring players would stay in the poorest places. Yamada: Right, right. So if you went somewhere and there was no hotel, you'd rent a house. And then there were the folk song fans. You could stay at their houses, they'd take you in. Because they loved the old songs. ST: So when you went to Hokkaido, you'd do rôkyoku ballads, skits, and Tsugaru songs. But what about the accompaniment for the ballads? Yamada: Ballads and accompaniment were always done in pairs. Each singer would have his own shamisen player. ST: Have you yourself played any ballads? Yamada: Rôkyoku ballads? Never. Folk singers do ballads for entertainment, and then they add a shamisen, but a real pro would never sing rôkyoku to shamisen accompaniment. If he did, people'd only say he couldn't sing. ST (to JNW): A rôkyoku is a long ballad sung in parlando style. JW: Is it more or less the same as a kudoki 口説き ballad? JW: This is all fascinating stuff, but I'd like to hear a little bit more about your career, if you don't mind. So after the herring catch collapsed, did you come back and start "Yama'uta" right away? Yamada: No. I was in Hokkaido most of the time. . . . Over here you didn't get all that many people, so it was difficult to earn your keep, that's why I was over there so much. I mean, Hokkaido is vast. If you were there for the entire year, you could somehow scrape by. But gradually pickings were becoming slim, even there, and that's when everyone left for Tokyo. . . The older players, they'd all been in Hokkaido, but now they all stopped touring and went to Tokyo to cash in on the live-house café boom. They just gave up on Hokkaido. I was the only one who ended up not going. I had to stay in Tsugaru. . . . If I had also gone away, there wouldn't have been any place left in Tsugaru where you could sing folk songs, and that would have been the end of the folk song itself. No, that's why I stayed here and never went to Tokyo. See, after I got back, I thought I'd finally settle down. Traveling. . . . It was no longer much fun, you know. At first I just stayed here, without doing anything in particular. Live-house caf?s might be a terrific boom in Tokyo, but if you were thinking that just because there was a Tsugaru-shamisen boom in Tokyo, right away there would also be a boom in Tsugaru itself, you'd have made a bad mistake. So I decided to just wait and see, and when that boom finally arrived, some four or five years later, it was my turn. That's when I thought, "There's no place like home. I'll start a live house in Tsugaru. It's been a boom in Tokyo for such a long time, I guess now's the time to start here as well." And so I did, and I'm still running it. JW: Was it a Tsugaru-shamisen live house from the beginning, or did you start it as primarily a drinking bar? Yamada: It was a folk-song live house from the very beginning. We called it a "Min'yô sakaba" 民謡酒場 (folksong bar) - that was its handle, so to speak. But its name has always been "Yama'uta." ST: Where was its first location? JW: What year was that? Yamada: Oh, that must have been in 1964. JW: And was it just you and your wife, at the beginning, or did you use younger people? Yamada: I used my students. JW: How long did your bar stay in Kajimachi? Yamada: Two years, then I relocated to the station area. See, there was this woman who used to work in a cabaret, "Gendai" 現代 ("Modern Times"), and she went and opened a sort of branch office called "Kifujin" 貴婦人 ("Noblewoman"). It was right over my bar. I was using the entire ground floor. Anyway, when that woman started "Kifujin," my business was about one, two years old. And then I heard there was a good location near the station, an old branch of the Aomori Bank 青森銀行. The Aomori Bank had moved some place else, and now the entire building was empty. So I went and had a look, and the whole place was deserted, so we moved there. JW: I loved that old place. Maybe it was a little scruffy . . .
JW: . . . But it had lots of atmosphere! Yamada: Yes, that was a good place, with a good atmosphere. For a while the customers would tell me, "This new place is no good! Why did you ever leave there and move in here?" Hell, they're still saying it, the people who remember the old place! JW: Your present place is a very contemporary building. Concrete, of course. Yamada: I wanted to put up a wooden building, just like the old place, but they wouldn't give me a building permit. Anything in wood is absolutely out. JW: A completely different kind of question. What do you think of the recent national interest in Tsugaru shamisen? It has now become a national boom, but is that really a good thing? Yamada: Well, the fact that it has now become a nationally famous instrument, I'm afraid that's all my doing. I did my best to make it so. But if you ask me why I did so, I'll have to talk about myself. . . . Well, I suppose I've got no choice, do I? At this point, the Tsugaru shamisen is no longer the exclusive property of Tsugaru. You yourself have told me many times, Professor Sasamori, that the Tsugaru shamisen is music representative of Japan - music that belongs to the world. That was the beginning. I just wanted people to remember - not just in Tsugaru, but in all of Japan - that there was such a thing as the Tsugaru shamisen. You didn't have to listen to it, as long as you remembered the words. That was my goal: to make all Japanese remember the name of the Tsugaru shamisen. I worked very hard for that, and let me tell you, it wasn't easy. And now the thing is to introduce the Tsugaru shamisen to the world as music representing Japan. I'd love to be able to do that - me, personally. For I've said it so many times, and Professor Sasamori here has said it so many times: the only music with a special Tsugaru sound is the Tsugaru shamisen - there's nothing else. . . .
JW: So exactly what did you do to turn the Tsugaru shamisen into a national kind of music? Yamada: For one thing, I organized a National Tsugaru Shamisen Contest 津軽三味線全国大会. That was in 1982. We invited players from all over Japan to the Hirosaki City Auditorium 弘前市民会館. To make it a national instrument, we got all shamisen groups together for a national competition. We already had one in Aomori Prefecture, but we needed them on a national level. And once we had those, we needed a national contest, here in Hirosaki. But the ultimate aim was to make the Tsugaru shamisen popular throughout Japan. ST: I had the opportunity to help him with that, and I have to say, Mr. Yamada is a very, very good producer. Besides doing all these contests and whatnot over here, he also traveled around to various other prefectures to spread the word, to invite people to come. He'd take his students with him, and a few singers, and cover the entire country. And one more thing: he also took the Tsugaru shamisen abroad, to the Newport Festival. He didn't worry about the money. If there was a chance, he'd take it. And he was also very good at advertising such performances in the newspapers or on television. He saw to it that the Tsugaru shamisen stayed in the news. JW: But how did you get to take part in something like the Newport Jazz Festival? Did you use any special connections? Or did you just write a letter to the organizers, saying, "I want to play in your festival"? Yamada: No, nothing like that. There is someone in Japan who sometimes takes jazz musicians to Newport. He asked me about having the Tsugaru shamisen at the festival, and I said, "Sounds good, why not?" But it took about two years before I got that far. I mean, it was not as if he was going to take me with him as soon as he had popped the question. "Let's think about it," I said, but it still took two, three years before I actually went. ST: Mr. Yamada also performs with artists in other, completely different genres, and that's another reason why the Tsugaru shamisen became popular throughout Japan. JW: So you now have a "national" Tsugaru shamisen, but can you still call it "pure" Tsugaru shamisen? I wonder. Do you think the way the Yoshida Brothers 吉田兄弟 play is pure? Yamada: I don't think so. What they play is not pure Tsugaru shamisen. JW: And how do you feel about that? Yamada: I tell such artists all the time, "Always remember that the real, the original Tsugaru shamisen and the style that you are playing - in other words, the 'adapted' Tsugaru shamisen - are two different things. Never mix those two styles up. When you go somewhere to play, you've got to tell them, 'This is what the real Tsugaru shamisen sounds like,' and then play it like that. If you want to play the Tsugaru shamisen for entertainment, that's fine, go ahead. But always realize that it's a form of entertainment, that it is no more than another way of playing the Tsugaru shamisen." That's what I always tell them. But because young people like this entertainment music, they like the Tsugaru shamisen, but they will all rush to hear the entertainment only. To ask a favor of his lord. . . ."
That's very different. So did the lyrics of the old songs - "Jonkarabushi," "Yosarebushi," whatever - did those lyrics change? ST: I think they changed because the listeners no longer liked them. But if you'd like to hear them sung, all they need is little bit of practice and you'll get your cross-legged louse . . .
JW: Oh, you know those lines about the louse? JW: But do you know what is meant by "louse"? "Louse" was a derogatory word for "poor farmer." In other words, it was a farmer who squatted down in the road. Fukushi: Oh, we have lots of songs like that. ST: But what he [JW] is means is, all those tourist-guide lyrics leave a bad taste. Yamada: They used to be all narratives, no tourist information at all. They're a lot less interesting since they changed. ST: But maybe that's what the customers wanted. Yamada: The customers never asked us to sing any particular words. I guess it's just a matter of the singers thinking that instead of listening to some boring old story the audience would much rather like to hear about Hirosaki Castle or Mount Iwaki 岩木山. Of course I know Mr. Yamada had nothing to do with all this, but I still think it's a great pity. I have a feeling that in the original songs there were very few farmers caroling on about the beauty of Mount Iwaki. They were singing about the things bottled up inside their own hearts. . . . I really think the old contents ought to be revived. ST: My own opinion is, the old kudoki ballads were full of love suicides, crimes and all sorts of violence. But those events were quickly outdated, and to revive them now. . . . I don't know. What can you do instead? Lift up your voice, make it as beautiful and strong as possible, and sing about the beauty of nature. Although, I believe there were a lot of obscene songs too. Yamada: My God, yes! And we had some filthy ones! Once you started with those, you could fill an entire evening. Anything dirty was a big hit. One song would bring the house down. But no one sings them any more. Yamada: They just stopped singing them. Yamada: Yes, that was very popular at one time, but nobody sings it now. Such songs are popular for a while, and the audience loves them, but they won't keep. You'd have to keep on writing new ones, adapted to the changing times, but nowadays nobody writes obscene songs any longer. There used to be people who specialized in the writing of lyrics, but nowadays there's nobody. Now the lyrics are always the same, you never hear any new ones. And it's only in the Japanese folk song that there is no one who writes good new lyrics. In the Japanese pop scene they come up with new songs all the time. Yamada: Yes, that's the only one. TS: About the girl who came to grief after she got married. . . .
Yamada: It's never been a big hit, but over the years people keep listening to it. JW: But if I'm not mistaken, that song has changed too. My wife happens to be from Kizukuri 木造町 (a town bordering on Morita Village 森田村 before both were incorporated into Tsugaru City 津軽市), and according to the older people there, "Yasaburô's House" used to be . . .
Yamada: Very different. You're right. JW: It used to sound much more sad. Yamada: The melody has changed. JW (checking his watch): We could go on like this for a few more hours, but I'm afraid we have bothered you long enough as it is. [Although the conversation continues for a few more minutes, the actual interview is over. We promise to show Yamada the transcript, and he invites us back any time we have questions. SASAMORI Takefusa suggests a second interview, involving FUKUSHI Ritsu, to talk about the way the contents of the Tsugaru songs changed in the course of the years, and perhaps also about her own career, and she appears to like the idea. About 4:30PM we are outside again.